New Delhi: The Employees’ State Insurance Corporation Hospital, Patna (ESIC Patna) has released 12 vacancies for Specialist on Full Time/Part Time, Contractual Basis for the period of one year against the vacancy of Regular specialists or the post is filled up on regular basis whichever is earlier. The selection will be done through Walk-in-Interview. The Walk-in-Interview will be held from 26th March to 29th March 2019. Reporting Time For Candidate:- Half an hour before scheduled Time of on the date of Interview. The Vacancies are in the Department of Anaesthesia, Pulmonary Medicine, Dermatology & STD, ENT, Ophthalmology, General Medicine, General Surgery, Obstetrics & Gynaecology, Orthopaedics, Paediatric, Pathology, Radiology. Qualification: Post Graduate Degree in the concerned specialty from recognized university with three year Experience after Post Graduate Degree in concerned specialty or MBBS with Post Graduate Diploma in the concerned specialty from recognized university with five year Experience after Post Graduate Diploma in concerned specialty. 1) For Full Time Specialists– Not exceeding 45 years as on date of interview. Relaxation in age for candidate belonging to SC, ST, OBC etc will be applicable as per rule. 2)For Part Time Specialists– Not exceeding 64 years as on date of interview. (1) For Full Time:-Basic pay Rs. 18750/-PM + Grade Pay Rs.6600/-PM in PB-3 with other allowance as admissible. (2) For Part Time:-40,000/-Per month consolidated and other admissible allowance in case of extra duty or attending emergency call. Transport Allowance will not be payable. The above Remuneration Structure can be revised following guidelines from the competent authority. Tenure:- The Tenure of the post will be for one year .However in the case if the post is filled up on the regular basis the contract can be terminated even before the completion of the period of one year. The contract is also extendable beyond the period of I (one) year if the vacancy and requirement continue to exists. The Tenure can also be short closed after serving one months notice. The Medical Superintendent ES1C Hospital Bihta reserves the right to terminate or modify the contract at any time in case of alteration/modification in policy on the suject from the headquarter office or any other regulatory institution. How to apply:- The eligible and willing candidates may appear for walk-in-interview along with duly filled in application form attached at Annexure-A of this advertisement. The candidate shall come along with original certificates and one set of self attested photocopy of the relevant certificate/documents in support of Age, Qualifications, Category, Experience, MCI / State Registration. and two recent passport size photographs. 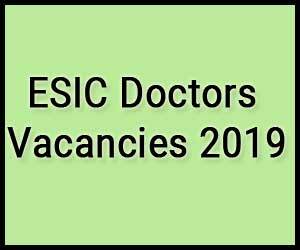 Applicants are advised to report to the office of Medical Superintendent, ESIC Hospital, Bihta, Patna (Bihar) on the dates of interview up to 9:30 AM. Along with all necessary certificates/documents as described above. 1. No TA/DA shall be paid for attending the interview and joining purpose. 2. In case of selection the candidate shall have to pay Rs.10000/- (Rupees Ten Thousand) only as Security Deposit, which is refundable after successful completion of contract period. 3. In case of selection the candidate shall have to enter into an agreement with The Medical Superintendent, ESIC Hospital, Bihta on an stamp paper (Non-Judicial Stamp paper) of Rs. 1000/- .The cost of stamp paper will be borne by the candidate. 4. The competent authority reserves the right to fill up all or not to fill up any post without assigning any reason thereof. 5. Vacancies are likely to change depending upon actual requirement at the time of interview. 6. Candidate shall submit dully filled in Application Form (with self-attested photograph affixed on it) along with necessary self-attested copy of certificates towards educational qualifications, experience should be submitted at the time of Interview. The candidate will also require to bring original certificates towards educational qualifications & experience. 7. Candidates working in Govt Service should produce No Objection Certificate” from their department at the time of Interview. 8. The engagement will not confer any right of preferences for regular appointment. 9. The engagement will be purely contractual and it will not confer any right to candidate for absorption in ESIC. 10. No claim for any service benefit like PF, Pension, Gratuity, Medical Allowance, Seniority, Promotion and leave will be admissible. 11. Private Practice of any kind will not be allowed in case of full time engagement. 12. Hostel Accommodation / Quarters will not be provided. 13. The decision of the Interview Board will be final on all aspects of selection and no further correspondence will be entertained under any circumstances. 14. The selection is subject to the candidates proving their medical fitness and verification of their character & antecedents. 15. Absence from work (duty) for a period of 15 (fifteen) days without proper permission of the competent authority will amount to voluntary abandonment of contractual-engagement and no further order of dis­engagement shall be necessary. 16. Any gross misconduct or negligence in the assigned duty may lead to termination of contract. 17. The Full time specialists will be entitled for one day leave on every complete month of duty on pro-rata basis. 18. The working hour for the part time specialist will be five days a week ,two session a day and two hour in each session. 19. The principal of “No work no Pay” will be applicable.